parks to close animal encounters in aquariums and zoos to family shows at the iconic Sydney Opera House. You can even climb aboard tall ships and sail on Sydney Harbour. World renowned Sydney NYE is a multi-tiered event held on Sydney Harbour, centering on the Sydney Harbour Bridge. Highlights include Welcome to Country, Harbour of Light Parade and fireworks at 9pm and midnight. At world-famous Bondi Beach relax on soft white sand and enjoy an invigorating swim between the red and yellow flags. Just 4 km from Rose Bay, you can learn to surf and discover stunning views on a coastal walk. There are also lovely picnic spots, beachside cafes and fine dining restaurants. With spectacular views of the harbour, Sydney's much-loved Luna Park is a superbly restored 1930s amusement park where everyone goes - just for fun! Darling Quarter has everything you need for a great day out or just a quick break from the bustle of the city. A diverse range of eateries and shops border Sydney CBD’s largest and newest free children’s playground, designed with innovative ways for your child to play, learn and expand their imagination. The golden sands and crystal waters of Bondi continue to capture hearts all around the world. Let's Go Surfing is Bondi’s only officially licensed surf school. Book a lesson and learn to surf at Australia’s most famous beach! With a blue horizon of eucalyptus trees that appear to stretch on forever, expect to be enchanted by the natural beauty of the Blue Mountains World Heritage Area. Set out on foot to explore some of the 140km of walking tracks, admire the native bushland, or marvel at the impressive rock formations and explore underground caves. The Maritime Museum offers an exciting program for the whole family with kid’s activities held on weekdays, weekends and during the school holidays. Kids and adults can also climb aboard the vessels including a real submarine and retired warship and roam the museum’s expansive exhibition space. 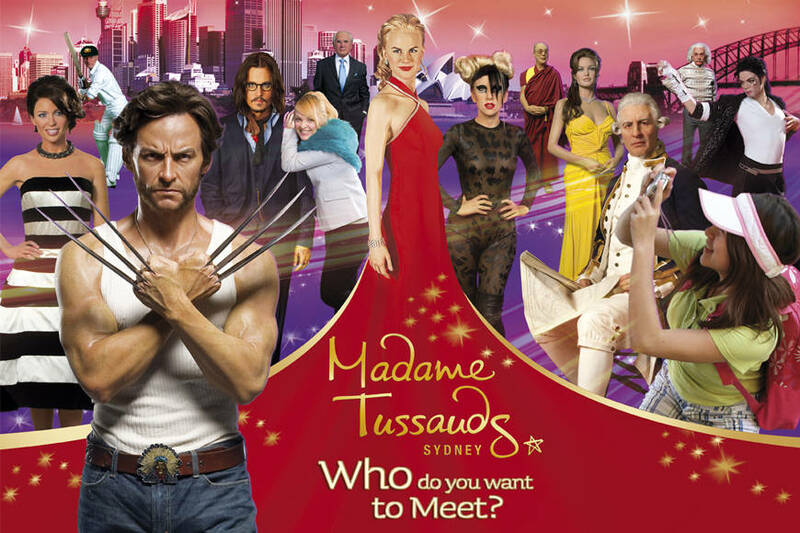 Madame Tussauds Sydney is located in Darling Harbour in Sydney and is situated on the Aquarium Wharf. The world famous wax museum remains just as popular as it ever was. There are many reasons for this enduring success, but at the heart of it all is good, old-fashioned curiosity. Watch live on Boxing Day 2018 the start of this iconic race from a fabulous Sydney Harbor viewing point. Over the past 72 years, the Rolex Sydney Hobart Yacht Race has become an icon of Australia's summer sport, ranking in public interest with such national events as the Australian Open tennis and the Boxing Day cricket test. There are many ways you can experience all the Sydney Opera House has to offer. Book tickets to Opera Australia's latest show and tick this iconic Sydney experience off your bucket list. Or sign up for a two-hour backstage tour which takes you into the exclusive domain of performers. Standing on top of the Sydney Harbour Bridge arch offers the best view of Sydney and the harbour, day or night! The climb takes in a 360-degree panorama of Sydney, and is enjoyed by thousands of people of all ages every year. Children aged 8 to 15 must be accompanied by and are the responsibility of an adult. One of Sydney's most famous attractions, the award-winning Taronga Zoo is home to over 4,000 animals, including Australian native wildlife, as well as rare and endangered exotic animals. Overlooking the magnificent Sydney Harbour, Taronga Zoo is just 12 minutes from the city by ferry and is open daily including Christmas day. Join an EcoTreasures snorkelling tour to discover more than 200 fish species in the calm, clear waters off Manly’s Shelly Beach. Easy introduction lessons are available for beginners and foam floating noodles are provided for extra safety. Suitable for beginner and experienced snorkelers! Spark your imagination and creativity with a family visit to the MCA. They offer exciting ways for adults and children to discover contemporary art and participate in fun and playful learning experiences together. In the city centre, the Sydney Tower Eye's outdoor Skywalk will thrill children aged 8 and older with its 360-degree views. Step out into the open air for a breath-taking 45 minute tour around the outside of the tower with an experienced guide. Located in the heart of Darling Harbour, Sea Life Sydney Aquarium is an underwater journey of amazing discovery with 12 extraordinary themed zones. Meander through the Jurassic Seas, Great Barrier Reef, Bay of Rays and Dugong Island (just to name a few), then, immerse yourself in the underwater world of Shark Valley, the majestic ocean tunnel walk-through. Sea Life Sydney is one of the world's largest aquariums - with over 700 different species and 13,000 animals in an impressive six million litres of water.